Rand gets off to rather poor start in her argument. She claims that the source of rights is “the law of identity.” “A is A—and Man is Man.” She might as well have just said The source of rights is the way things are, for that’s what all this pretentious talk about rights stemming from the law of identity amounts to in the end. Rand here commits the error of begging the question. What we need is compelling evidence that man’s rights do in fact stem from the way things are, not merely the assertion that this is so! Next we are confronted with an even more mystifying assertion: “Rights are conditions of existence required by man’s nature for his proper survival.” Now what could Rand possibly mean by this? She comes perilously close to suggesting that rights are requisites of man’s survival, but she evades this palpably absurd conclusion by specifying merely that rights are necessary for a “proper” survival. Now what is this “proper” survival, and how is it distinguished from an improper survival? She intentionally says nothing about this, leaving plenty of wiggle room so that she can easily use the ambiguity to equivocate to any conclusion she pleases. In the next sentence, Rand merely repeats what she said before, except now she has placed it in a conditional: if man is to live on earth, then, she claims, it is right for him to use his mind, act on his free judgment, work for his values, and keep the product of his work. Yet again, this is not an argument, it’s a merely a vague assertion. Even worse, Rand is once again implying the absurd conclusion that rights are necessary to life. She offers a second conditional which again implies an absurdity: “if life is man’s purpose,” she argues, “he has a right to live as rational being.” The argument, among other things, seems (perhaps unwittingly) to suggest that a purpose bestows a right. It is not clear at all how this can be so. The fact that I have a purpose in no way grants me a right. Not in the least; I only have those rights which have arisen in the society I live in, regardless of what I might wish or purpose. Most individuals, taken on their own resources alone, have no control over the legal structures that exist where they are born. If you are born in North Korea, you have no rights, regardless of what purposes you might have. Although Rand’s rhetoric is confusing, what she seems to be attempting to argue is something along the following lines: (1) that in order to live, men must be “rational”; (2) that rights are necessary in order to be rational; (3) that, therefore, rights are necessary in order to live. If by rationality we mean deliberate, conscious thinking guided by “logic,” premise (1) is almost certainly false. Human beings, as cognitive science has shown, are governed to a considerable extent by the cognitive unconscious, which can hardly be described as “rational.” Premise (2) is deeply problematic. The rationale behind it is the idea that, unless an individual is free, he cannot follow the dictates of his mind. But this assumes that the political alternatives facing mankind are either a complete and total subjugation of the individual on the one side or a complete freedom on the other side. In the real world, it doesn’t work like that. Even a slave has some room for initiative and rationality, and a citizen in a welfare state has a great deal more. So Rand’s argument breaks down completely, which is just as well, because the conclusion is, as I have already noted, absurd. Sorry, but rights are not necessary for life. If men could not survive without rights, the human race would have disappeared long ago. Rand concludes by asserting, again without offering a shred of evidence or proof, that any group that denies man’s rights “is wrong, which means: is evil, which means: is anti-life.” Once more, we are confronted with a frustrating vagueness in which Rand seems to equivocate between saying something that is clearly contrary to the facts or that is banal. Does she really want us to believe that a denial of “man’s rights” leads to death? Throughout most of human history, most human beings have had virtually no rights at all. Many have been little better than slaves or peasants. Yet somehow the human race has managed to survive, in the very teeth of Rand’s anathema. So what does Rand mean by claiming that a denial of rights is anti-life? She means only this: that she doesn’t like it! Sorry, but that’s not a good argument. Even if you could (per impossible) change society through argumentation, you would never get anywhere with arguments as bad as these! Individual Rights 1: Theory and practice. Rand tells us, in her usual ex cathedra manner, that “the right to life is the source of all rights” Let us ignore the obvious question What is the source of the right to life? and instead focus on the practical side of this question. What is the practical source of rights? where do they come from in practice? This is a distinction conveniently ignored by Objectivists, who live in a land of idle fancy where things can come into existence merely by wishing them to exist. Wouldn’t it be nice, the Objectivist thinks to himself, if people didn’t commit acts of aggression against one another? Of course it would be nice. So, like magic, Rand’s individual rights strut upon the stage, dressed up in Rand’s wonderfully vague and hollow rationalizations, expecting to be realized without any real blood, sweat, or tears being shed for them! Where in all of Objectivism is this question of Might ever approached in a non-wishful-thinking, adult manner? It is the easiest thing in the world to talk about rights or scribble about rights on a piece of paper or build castles-in-the-air about rights in society. But to make such rights actually exist in the world of fact, so that individuals universally abide by them, that is a much more difficult task, and all the talking and scribbling and arial castle building in the world won’t ever surmount the difficulties involved. The key point in Pareto’s disquisition concerns the difficulties of enforcing or applying any theory of rights in practice. To enforce such a theory requires the threat (and perhaps use) of violence. More than that, it requires greater force than is applied on behalf of other theories regulating the division of social advantage. Given everything we know from history about human nature, there are no compelling reasons to believe that Rand’s notions about individual rights will ever be applied in the practical affairs of men. It is a theory concocted by intellecutals who have no practical experience in the real world of politics and who therefore have no clue how to apply their theories in practice. Rand herself focuses nearly all her attention on the theoretical side of the question, as she operates under the illusion that, if she merely provides the best rationalization possible for her theory, the practical side will take care of itself. This demonstrates a lack of judgment about human affairs that is appalling in someone as intelligent as Rand. Yet this is not the worst of it. Not only did Rand fail to provide any solution to the practical side of the problem; her theoretical solution, as I shall demonstrate in future posts, is itself riddled with gaping logical holes. "'Standard logic' this may be; Objectivism, I submit, it ain't." Objectivism makes a great play of its commitment to logic. "The fundamental concept of method, the one on which all the others depend, is logic", Rand intones in her scanty "Introduction To Objectivist Epistemology". But it turns out that like so much of Objectivism, this purported commitment to an objective standard of argument turns out to be fake; yet another shell-game played with words. All she and her followers are really committing to is her own peculiar definition of logic, which she calls "the art of non-contradictory identification." What this means when the rubber hits the road of a syllogism, and how it fits or does not fit with the rules of standard bi-valent logic as they've evolved over the centuries, Rand chose to never explain. This deliberate obscurity has given her followers license to posture as if they're defenders of the great rational tradition, when in fact they discard it whenever they see fit. This rejection of common standards of logic is naturally not so trumpeted; when speaking from two sides of your mouth, usually one side is sotto voce. But it is nonetheless clearly discernable. For example, prominent Objectivist Harry Binswanger claims Objecto-logic is a "new, improved" version of standard bi-valent logic. "New"? How so? Improved in what way? Binswanger only offers a few unhelpful obscurities by way of explanation. Objectivist Lindsay Perigo goes even further. When discussing a perfectly valid syllogism, he simply rejects it wholesale: "'Standard logic' this may be; Objectivism, I submit, it ain't." Rarely do we get such clear-cut statements of how Objectivism's arguments are basically incompatible with the logical standards Rand claimed to uphold. This double standard regarding classical logic fuels Objectivism's underlying cultist and irrationalist bent. In short: where logic clashes with Rand's pronouncements, it is logic that must be rejected. That, when examined, Objectivism's arguments can only survive by appealing to a special, conveniently obscure Objecto-logic in conjunction with a special Objecto-language tells us pretty clearly what's really going on here. Self-interest and the Welfare State. Although David Kelley’s brand of Objectivism tends to be several notches above what we find over at ARI, being saddled with some of Rand’s less defensible notions can lead even Kelley astray. Consider what Kelley wrote about altruism and welfare state in the 1998 article “State of the Culture”: "The primary political expression of sacrificial altruism today is the welfare state. And one of the primary foundations of the welfare state is the idea: 'We're all in this together. We should sacrifice to each other and help out those who are in need.'" Is it really true that the “primary political expression of sacrificial altruism” is the welfare state? Do we have a welfare state primarily because people have bought into altruistic rationalizations? If people could convinced that self-interest is good, would they immediately abandon the welfare state and embrace laissez-faire? No, of course they wouldn’t, because the primary motivation for the welfare state is self-interest. The welfare state provides: (1) social security to supplement one’s retirement income; (2) supplemental income to cover medical costs for the aged; (3) income for disabled persons; (4) unemployment insurance to help those who have lost their jobs. All these provisions appeal to the self-interest of middle-class individuals. Indeed, the American welfare state is largely orientated towards the needs of the middle class. It is, hence, a middle-class welfare state appealing to the self-interest of the broad electorate. In the nineties, President Clinton passed the “Personal Responsibility and Work Opportunity Reconciliation Act,” which reformed that section of the welfare state that dealt, not with the Middle Class, but with the poor. This is a rather curious phenomenon. Americans have no trouble reforming welfare to the poor, even if it means cutting or placing restrictions on benefits. But no attempt has been made to cut or limit benefits to the middle class. On the contrary, welfare benefits to the middle class, if they are changed at all, are increased, as they were under President Bush’s Medicare drug benefit plan. Now the only way to explain this is to assume that middle class voters are primarily motivated by self-interest, not by altruism. Rand’s claim, that from America’s start, she “was torn by the clash of her political system with the altruist morality,” is clearly a gross exaggeration. Generally speaking, in politics, altruistic motivations are dwarfed by self-interest motivations. So condemning altruism is nothing to the purpose. People, of course, like to pretend to be “altruistic”; and they sometimes are “altruistic” in the sense that they give to charity or support (relatively modest) government support for the poor. But hardly anyone follows Rand’s version of altruism to the letter. Self-sacrificial altruism is largely a rhetorical pose used by sentimentalists to make themselves feel good. It’s not an important determinant of the political structure of the nation. Inveighing against it is waste of time. Precisely because people tend to be more interested in the welfare of themselves and their loved one’s than in the welfare of strangers, appeals to self-interest tend to be more persuasive than appeals to altruistic sentiments. (Best of all are arguments that appeal to both self-interest with altruism, since people tend to like nothing more than to think that by pursuing their own interest, they are helping others.) If the welfare state really was, as David Kelley argued, the “primary political expression of sacrificial altruism,” one could make persuasive arguments against it. But since, in reality, the welfare state is primarily an expression of self-interest, arguing against it on the basis of self-interest is counter-productive. Nor is making the distinction between “rational” self-interest and other varieties going to be of much help, since it is not clear what “rational” means in this context. Why is desiring to live under a safety net any less “rational” than being prey to misfortune? Once we have unmasked the hollowness of Rand’s attempt to base laissez-faire on “self-interest,” we can appreciate how ineffective her arguments are for capitalism. Rand’s mistake was to take the bad arguments for socialism (i.e., arguments that appeal to altruistic sentiments) far too seriously. Hardly any one is convinced by such arguments nowadays. So trying to refute them in the heavy-handed, Randian manner serves no purpose at all. 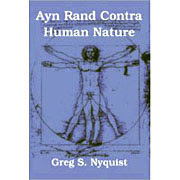 One of the most obvious signs of cultism in Objectivism is the desire for Objectivists to believe Ayn Rand was somehow a sui generis, all-purpose genius with a list of Amazing Achievements on a par with, as one commenter here has noted, Paul Bunyan creating the Grand Canyon by merely dragging his axe behind him. It is simply not acceptable to the cultist that she was a merely important historical figure, or a popular novelist, or a particularly clever and charismatic woman. This is so inadequate as to be insulting. No, they really want to believe that she is the greatest thinker since Aristotle, and that she solved all the major philosophical, economic, aesthetic, and political problems of the past two thousand years, as well plus a host more that no-one even knew about, all without the help of any other thinker since the Big A himself. - The idea of art as a selective re-creation of reality according to an artist's "metaphysical value judgments"
Um...actually its not very "challenging" at all to debunk this. I did so in comments, which I now reproduce here. One of the recurring problems with philosophy in general, and Objectivism in particular, is verbalism: a fondness for high-sounding gobbledygook that appears impressive, but is actually either empty, or merely masks a commonplace. So let's unpack what you're trying to say here, which seems to be simply that people who produce things, and are oppressed, shouldn't put up with it. Now, there are any number of people who have said this sort of thing, from Spartacus to Karl Marx. How you can think this is some sort of historically unique insight on Rand's part is quite remarkable. So this is hardly original. Rand does add a twist, however, in that in her novels the "oppressed" are businessmen, architects, and inventors. Is this twist any good? Are they seriously"oppressed"? Well, speaking as a businessman myself, While I sometimes feel oppressed by many things, including the government. But even in that case, in a democratic society I can lobby politicians, vote, and change things. Further, most businessmen I know enjoy a as much if not more freedom than government officials or the workers they employ. Thus considering myself very much more "oppressed" than others seems to be either a rhetorical fantasy or a species of self pity, neither of which seems much of an argument. So, Not Original, and Not particularly Good. This is a bad piece of gobbledygook. I will attempt to translate: Kant didn't believe man's brain worked, hence he was an irrationalist. Now this is potentially a wide debate, as Kant is a controversial figure, so I'll just note that this view, even if it is Good, which is doubtful, it is certainly Not Original to Rand. Actually, Rand produced no such "derivation" - if you mean logically, that is, and of course this is the only "derivation" that matters. If you think she did, please produce it, with formally labelled premises and conclusion. Or, produce your own version of what you think she was "deriving". I don't think you will succeed. So the issue here is not the quality or originality of Rand's insight, but simply its non-existence. Well, let's break this down. "Concept formation" is aimed at solving the so-called problem of universals, which in itself can be summarised in a non-gobbledygook way as the problem of why different things are similar. As such we immediately see why "the retention of similarities" is of no help whatsoever in this - it is about as good as saying things are similar because they have similarities. As for measurement omission, this is for once is Original. Here Merlin Jetton explains why it is Not Good. 5) The idea of art as a selective re-creation of reality according to an artist's "metaphysical value judgments"
Again, let's strip away the pretentious verbiage and see what this theory actually amounts to. "Selective recreation of reality" seems to simply mean an artist chooses a subject. Not exactly an amazing insight. But why does he choose it? Because of his "metaphysical value judgements", apparently. Once again, this seems to be padded with verbiage like "metaphysical" in an effort to make it sound more intellectual. We might just as well say "value judgements" or even "values". So we then see Rand's theory as: an artist chooses a subject according to his values. So a gloomy artist will choose gloomy subjects, and recreate them in a gloomy way, a happy artist will choose happy subjects and recreate them in a happy way, etc etc. Childish as it sounds, that's all this amazing theory predicts. Not exactly Original, certainly Not Good. It is true that Rand's axiomatic concepts are original. What is lacking is arguments as to why they are good. They are in fact so vague that they can fit just about anything you like. For example, Bertrand Russell presented "Existence exists" to one of the British Idealists - I think F H Bradley - and he had no difficulty accepting it. So: Not Good, at least as a refutation of what Objectivism opposes. Funnily enough, one has to choose to focus the mind, creating something of a problem for this "insight." Not Good. Let's see. I pull out Von Mises' "Human Action" and what do I find? : "It is customary to say that acting man has a scale of wants or values in his mind when he arranges his actions. On the basis of such a scale he satisfies what is of higher value...and leaves unsatisfied what is of lower value..."(p94) So not only can we find it in Mises for starters, please note the phrase "It is customary...". In other words, it's merely a commonplace observation. So, Not Original in the least. So in summary, it is quite easy to answer your challenge. I know that wild claims regarding Rand's brilliance and originality are widely promulgated by her followers, such as the Institute that bears her name. But what is remarkable to a non-Objectivist such as myself is how uncritically you've accepted them. Hopefully my passing comments will give you some pause for thought. And how did mtnrunner2 react to someone actually taking up his awesome "challenge" ? He simply asked me not to post there again.